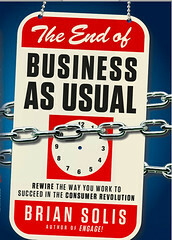 Colleague Brian Solis’s latest book, which focused on organizational change across many of today’s disruptive companies launches –I want you to buy End of Business as Usual now for your team. In the spirit of Groundswell, Open Leadership, and Engage, another book to your business library is available. The book is organized in two distinct phases. The first focuses on the changes to the converged and connected customers, the external forces. This is suitable for anyone who’s focused on customer strategy from marketing to support to product innovation. The second half is designer for changes leaders within your company. These change agents within corporations may be managers, VPs, and your CEO who wants to shift the corporation to quickly adapt. Across all of the book, I was excited to see see charts, diagrams, bring the book to life, including some of Altimeter’s work on org models and how companies are changing internally. If you want to learn more about the book, see the dedicated page discussing the premise at End of Business.